Try Goformative to create an assessment that will give live results. What an amazing tool! Goformative is a an amazing free website where you can create assessments (M/C, T/F, open-ended, drawing) and will show you instantly how the users are doing. The users do not need to be part of a class (does make it easier) as they just need to type in the unique code that is created when you create the assessment. Below you will two embedded videos that I created. 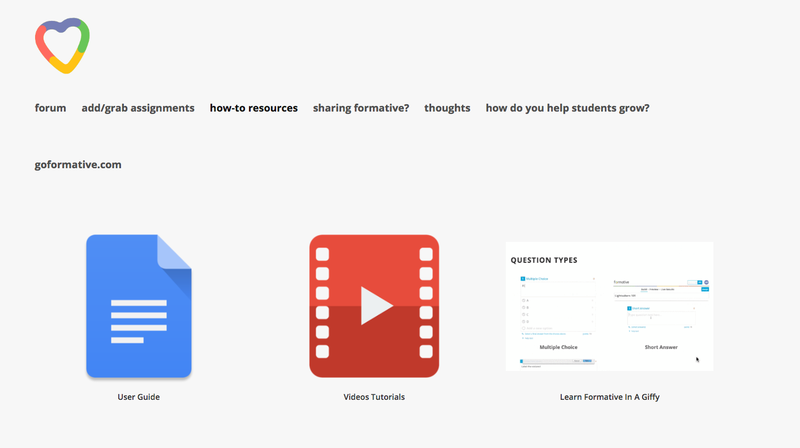 These videos are purely a small little peak into the Goformative site and what it can do. More information will be posted throughout the year. The 1st one is a little over 2 minutes showing what an assessment looks like for a student as well as what the results look like as a teacher. The 2nd video is a little over 6 minutes and shows how to create and assign an assessment. Click here for a link to some outstanding resources (see picture below of what is included). The "Learn Formative in a Giffy" is well done.